The Post Installer's Configure Windows Features panel enables you to turn on Windows Authentication. 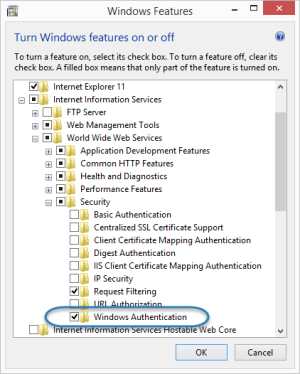 Turning on Windows Authentication in the Post Installer is equivalent to installing Windows Authentication in Internet Information Services (IIS) and enabling the Windows Authentication Windows feature. Essentials Security: To secure Essentials using the Windows Integrated security provider. Manager Single Sign-On: To enable single sign-on to Manager, so you do not need to enter your username and password. Single sign-on to Manager is supported by the Windows sign-in method only. For information, see Choose a Method to Sign In to Manager.